Taste some of the finest donuts that Chicago has to offer on this 2 hour Walking Tour. On this tour, we'll make four stops at some of the best donut spots in the city. We hope you can join us. We've always had a passion for donuts, but only recently did we realize just how many others do too. And when looking around, we didn't see anything that truly celebrated donuts in all their glory, hence the Underground Donut Tour was born. The Underground Donut Tour takes place over two hours. We'll visit four of the best donut stores in the city. 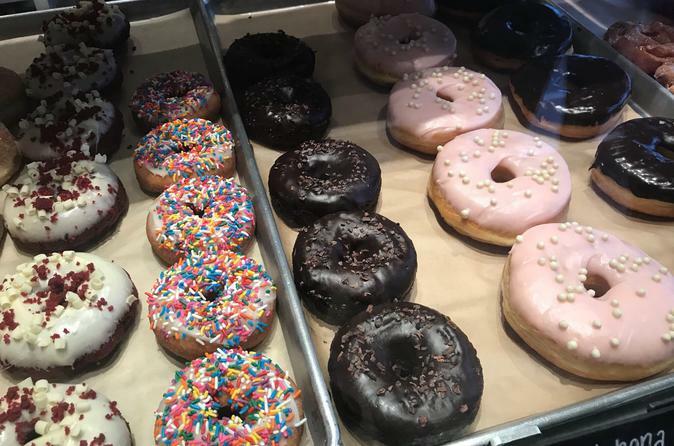 All of them are located in the Chicago Loop area and we'll try a few donuts from each location. This tour is for anyone who truly enjoys donuts. We run the tour on Saturdays and Sundays. The Friday & Saturday Tours start at 131 N. Clinton at Chicago's French Market (Dapper Doughnuts). The Sunday Tour starts at 50 W Randolph St. (Do-Rite Donuts). Both days are equally delicious.